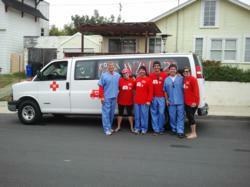 Fitness Boot Camp Franchise SoCal Fit Body Boot Camp Supports Diabetes Charity in SoCal Ragnar Relay. Ragnar is one of the most mentally and physically challenging races I have ever done. Once I joined Fit Body Boot Camp and met Israel, it was clear to me that a partnership with the Ambulance Chasers would allow us to achieve great things together. Pacific Beach fitness training specialists SoCal Fit Body Boot Camp and its Owner, Israel LoBue, have announced that they will be teaming-up with Barbara Laskaris and the Ambulance Chasers to run in the upcoming SoCal Ragnar Relay, scheduled for April 19-20. The Team’s goal is to raise monies and support for Taking Control of Your Diabetes (TCOYD), a charity organization that was created to educate and motivate people with diabetes to take control of their lives. The Ragnar Relay (http://www.ragnarrelay.com) is an overnight team running relay race that starts in Huntington Beach and ends in the Embarcadero in Downtown San Diego. Team members must each run 3 legs of the 200 mile relay, which takes place over 2 days and 1 night. The Ambulance Chasers are targeting to raise $20,000 for TCOYD. Individuals who are interested in supporting their goal can visit http://www.tcoyd.org, click on the “Giving” tab, input their donation amount and donor information, and be sure to put RAGNAR RELAY in the comments section to earmark their donation. For individuals who are interested in finding out more information about the Ambulance Chasers’ future races and events, please email Barbara Laskaris at barbaralaskaris(at)gmail(dot)com. Taking Control of Your Diabetes (TCOYD) is a not-for-profit 501(c)3 organization that is focused on educating and motivating people with diabetes to take a more active role in their condition, and provides innovative and integrative continuing diabetes education. TCOYD is guided by the belief that every person with diabetes has the right to live a healthy, happy, and productive life. For more information about TCOYD, please visit http://www.tcoyd.org.